Anchor Brewing Company will once again celebrate America’s first handcrafted beer, Anchor Steam® Beer, with the return of Drink Steam Week August 12-19, 2018. Back in 2015, the city of San Francisco proclaimed the third week of August to be Drink Steam Week, celebrating Anchor’s pioneering role in the American craft beer movement and continued commitment to brewing in San Francisco. In its fourth annual year, Drink Steam Week has continued to expand nationwide and will consist of events and happenings across the country celebrating Anchor’s rich history. See below for all the ways we’ll be celebrating in the Bay and beyond! To celebrate Drink Steam Week, honoring the heritage and legacy of Anchor Steam Beer, we’ll run a $4 special on Anchor Steam pints all week! As a special, exclusive offering, we’ll also be pouring Unfiltered Steam Beer on tap for the duration of Drink Steam Week! It’s the Anchor Steam Beer you know and love, but unfiltered. If you ask any Anchor Brewer how they like to drink Anchor Steam they’ll say, “straight from the cellar tanks.” This beer is us extending that experience to you. Pints and growler fills available. There’s no better way to celebrate Drink Steam Week, honoring Anchor’s pioneering role in the American craft beer movement and commitment to brewing in San Francisco, than to tour the brewery itself! Get a glimpse at centuries-old craft brewing traditions, a bit of San Francisco history, and a generous tasting of selected Anchor beers. To celebrate Drink Steam Week, all Humphry Slocombe locations will be serving up tasty scoops of Anchor Steam ice cream; rich, caramel flavors with a light, creamy finish. Join Après Yoga for a 1-hour yoga class at Public Taps followed by beers and socializing with your fellow yogis! Kickoff Drink Steam Week with us at Stern Grove Festival! For the 7th year in a row Anchor Brewing is a proud sponsor of Stern Grove Festival, which is hosting its 81st season of free concerts! Watch the Giants take on the Dodgers on our 8k lumen laser projector and 189” screen! 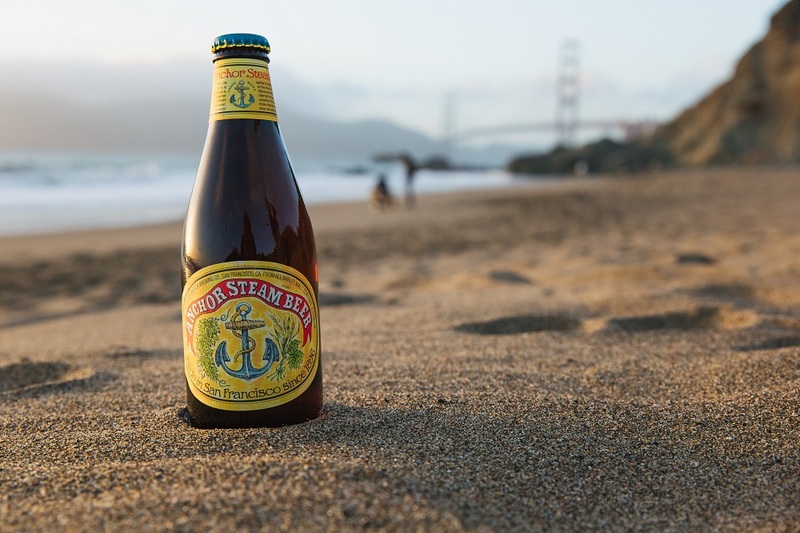 Cheer on San Francisco while drinking San Francisco’s original since 1896, Anchor Steam Beer! We’ll also have Los Gigantes on tap, a Mexican style lager brewed in collaboration with the SF Giants! Round up the beer geeks in your life and head to Anchor Public Taps for a special edition of our weekly Trivia Tuesday! Anchor brewers will be leading beer trivia rounds covering everything from brewing processes, craft beer history, beer styles, and more! Trivia is free to play and great prizes are on deck for the winners! Anchor Brewing and local DIY school Workshop SF have been collaborating to bring our city Drink Steam & Make Stuff events since 2015! To celebrate Drink Steam Week this year, Kelly McVicker of McVicker Pickles will be leading a beer mustard making workshop. And of course, we’ll be using fresh Anchor Steam, right off the tap, for these mustards! Each participant will get to mix their own small batch of mustard using fresh herbs and spices, vinegar, and beer! Fresh Anchor Steam will be flowing from the taps, along with a variety of other Anchor beers. Come out and meet the brewers who make San Francisco’s original beer! Join us for a very special concert at The Independent featuring Bay Area bands Foxtails Brigade and vverevvolf with special guest Yassou. Raise Your Anchor to local tunes and local brews! This show is supported by Anchor Brewing, San Francisco’s original brewery since 1896. Join us and celebrate Anchor’s 4th annual Drink Steam Week 8/12-8/19, honoring Anchor’s pioneering role in the American craft beer movement and commitment to brewing in San Francisco. To celebrate, The Independent will be serving our new 19.2 oz. cans of Anchor Steam Beer at the bar all night! Join us every Friday for the release of a new, limited beer available exclusively at Anchor Public Taps! This Friday we’re celebrating Drink Steam Week with the release of Emperor Norton, an imperial Steam Beer. Meet the brewers! Enjoy 19 Anchor beers on tap—including classic brews and limited releases—and get delicious grub from the food truck! With DJ’s and performances curated by the magical Siobhan Aluvalot & friends. Anchor Brewing tap takeover featuring Anchor Steam Beer, California Lager, Brewers’ Pale Ale and San Franpsycho IPA. $5 beers all night long! Access to our silent auction kindly donated by our sponsors with experiences available that money just cannot buy! Anchor Brewing Company has been brewing handcrafted beer in the heart of San Francisco since 1896, 12 years before Hotel Utah came around. Although the city has changed and evolved tremendously since the start, these two San Francisco legends still serve up delicious beer and grand times. To celebrate Drink Steam Week and Hotel Utah’s 110th anniversary, we’re offering Anchor’s Steam and California Lager on tap and Anchor’s Porter and Brewers’ Pale Ale in bottles for $5 all night! Closeout Anchor’s 4th Annual Drink Steam Week at Public Taps with an afternoon of fresh handcrafted beer, local makers, and good times! Honoring the heritage and legacy of Anchor Steam Beer, we’ll run a $4 special on Anchor Steam pints! As a special offering, our brewers will tap a rare cask of Smoked Steam Beer! Enjoy a pour of this unique beer and meet the Anchor brewers. As another exclusive offering, we’ll be pouring Unfiltered Steam Beer on tap; it’s the Anchor Steam Beer you know and love, but unfiltered. If you ask any Anchor Brewer how they like to drink Anchor Steam they’ll say, “straight from the cellar tanks.” This beer is us extending that experience to you. There will be complimentary Anchor Steam Cream from our friends at Humphry Slocombe, while supplies last. Enjoy it on the side or combine it with Anchor Steam Beer to make a beer float! San Franpsycho will be live screen printing onsite! They’ll be printing four different Drink Steam designs from our collaborations over the years. Don’t miss this opportunity to get these exclusive prints before they go back into the archives! Bring your own garment for a discounted print. Also, San Franpsycho will be showcasing their Summer line, inspired by the California coast. All participating locations are within 3 blocks of each other and the 19th Street BART station for convenience. Celebrate Drink Steam Week with the Anchor crew during our 2nd annual Drink Steam Week Bar Crawl in Oakland! In honor of Anchor’s pioneering role in the American craft beer movement, beer fans can enjoy specials on fresh drafts of Anchor Steam Beer at each location! $15 BBQ plate with house-made Anchor Steam BBQ sauce! BBQ plate features ribs, 2 sides, and a bag of chips. Vegetarian option available. Add an Anchor Steam to your order for just $5! Come celebrate Drink Steam Week with the Anchor crew at Finnegan’s in Novato! In honor of Anchor’s pioneering role in the American craft beer movement, beer fans can enjoy fresh Anchor Steam drafts, along with a few other special Anchor beers on tap! Belly up to the bar and Raise Your Anchor to the legacy of Steam Beer! Join us and celebrate Drink Steam Week with the Anchor crew at Gestalt Haus in Fairfax! Raise Your Anchor to the legacy of Steam Beer! Celebrate Drink Steam Week with the Anchor crew at Boulevard Cafe in Daly City! In honor of Anchor’s pioneering role in the American craft beer movement, beer fans can enjoy fresh drafts of Anchor Steam Beer, California Lager, Brewers’ Pale Ale, and San Franpsycho IPA all week! Come celebrate Drink Steam Week with the Anchor crew at Old Princeton Landing in Half Moon Bay! In honor of Anchor’s pioneering role in the American craft beer movement, beer fans can enjoy $1 off fresh drafts of Anchor Steam Beer and San Franpsycho IPA! Anchor Brewing giveaways, while supplies last! Plus, celebrate Taco Tuesday with $1 tacos! Join us and celebrate Drink Steam Week with the Anchor crew at New England Lobster Market & Eatery in Burlingame! In honor of Anchor’s pioneering role in the American craft beer movement, beer fans can enjoy $1 off fresh drafts of Anchor Steam Beer and Mango Wheat! Anchor Brewing giveaways, while supplies last! Enjoy happy hour pricing on lobster tacos, lobster cocktail, and lobster claws—come hungry! Belly up to the bar with folks from the brewery and learn about the legacy of Steam Beer! Come celebrate Drink Steam Week with the Anchor crew at Sam’s Chowder House in Half Moon Bay! In honor of Anchor’s pioneering role in the American craft beer movement, beer fans can 50% off fresh drafts of Anchor Steam Beer. Pair with Anchor Steam Beer battered fish and chips, so come hungry! Anchor Brewing giveaways, while supplies last! Celebrate Drink Steam Week with the Anchor crew at Alpine Beer Garden in Portola Valley! In honor of Anchor’s pioneering role in the American craft beer movement, beer fans can enjoy $1 off fresh drafts of Anchor Steam Beer! Anchor Brewing giveaways, while supplies last! Come celebrate Drink Steam Week with the Anchor crew at Sacramento’s Beach Hut Deli! In honor of Anchor’s pioneering role in the American craft beer movement, beer fans can enjoy $3 pints of Anchor Steam all week and get a souvenir glass while supplies last. Join us and celebrate Drink Steam Week with the Anchor crew at Sacramento’s Hilltop Tavern! In honor of Anchor’s pioneering role in the American craft beer movement, beer fans can enjoy $4.50 19.2 oz. cans for Anchor Steam and $5.50 pints of California Lager. Celebrate Drink Steam Week with the Anchor crew at Socals Tavern, where Anchor Steam Beer has been on tap since 1977! In honor of Anchor’s pioneering role in the American craft beer movement, beer fans can enjoy fresh pints of Anchor Steam get a souvenir glass, while supplies last. Come celebrate Drink Steam Week with the Anchor crew at Sacramento’s Tank House BBQ & Bar! In honor of Anchor’s pioneering role in the American craft beer movement, beer fans can enjoy $5 pints of Anchor Steam and get a souvenir glass while supplies last. There will also be a Bar & Ball feature- a can of Los Gigantes and shot of Jack Daniels for $9. Kick off Drink Steam Week with the Anchor Brewing crew on a special Bar Crawl in Reno! Belly up to the bar with the Anchor folks and learn about the brewery’s unique history and brewing style. We’ll start the bar crawl at Mellow Fellow with $4 Anchor Steam and Los Gigantes and $5 San Franpsycho IPA. Next up is Doc Holidays with $3 Anchor Steam pints, before heading to Imperial for Anchor Steam drafts and bottles of Brewers’ Pale Ale. Then, we’ll head over to Our Bar for Anchor Steam and California Lager drafts. From there, we’ll move on to The Stick and end at The Eddy, both featuring Anchor Steam and San Franpsycho IPA on tap. Join us during Drink Steam Week at The Eddy for a very special event featuring an Anchor Steam Beer Cocktail Competition! See which local bartender can make the best craft cocktail using Anchor Steam Beer! The winning bartender will receive the Steam-tails award plaque with their name and bar engraved on it with the winning year. Come celebrate Drink Steam Week with the Anchor crew at Yorktown’s Water Street Grille! In honor of Anchor’s pioneering role in the American craft beer movement, beer fans can enjoy a wide variety of Anchor beers including Anchor Steam, San Franpsycho IPA, Brewers’ Pale Ale, and Anchor Porter. Anchor giveaways while supplies last! Celebrate Drink Steam Week with the Anchor crew at the Oyster Point Pub! In honor of Anchor’s pioneering role in the American craft beer movement, beer fans can enjoy a special Anchor Tap Takeover including Anchor Steam, San Franpsycho IPA, Brewers’ Pale Ale, and Anchor Porter. Join us and celebrate Drink Steam Week with the Anchor crew at Portsmouth’s Humboldt Steel Corporation! In honor of Anchor’s pioneering role in the American craft beer movement, beer fans can enjoy two craft classics, Anchor Steam Beer and Anchor Porter. Anchor giveaways while supplies last! Celebrate Drink Steam Week with the Anchor crew at Norfolk’s Humboldt Steel Corporation! In honor of Anchor’s pioneering role in the American craft beer movement, beer fans can enjoy two craft classics, Anchor Steam Beer and Anchor Porter, plus our newly released Brewers’ Pale Ale. Anchor giveaways while supplies last! Come celebrate Drink Steam Week with the Anchor crew at No Frill Bar & Grill! In honor of Anchor’s pioneering role in the American craft beer movement, beer fans can enjoy a special Anchor Tap Takeover including Anchor Steam, San Franpsycho IPA, Brewers’ Pale Ale, and Anchor Porter. Plus, Anchor giveaways while supplies last! Celebrate Drink Steam Week with the Anchor crew at Bottlecraft in Virginia Beach! In celebration of Drink Steam Week, try two different Anchor Steam Beer battered oysters: Honey Wasabi and Sweet & Spicy Sriracha. Also on the menu, is Anchor Steam Beer battered cod and chips, served with malt vinegar and housemade artichoke caper tartar sauce. Pair with Anchor Steam Beer on tap.